A bid to rename the title of chairman of East Sussex County Council to improve inclusion and gender equality has been unsuccessful. Lib Dem Sarah Osborne suggested the terms chair and vice-chair be used at County Hall instead. But a counter proposal by the Conservatives to allow each individual office holder to choose how they are addressed was approved on Tuesday (May 15). Cllr Osborne (LDem, Ouse Valley West and Downs) argued that her proposals ‘would send a clear message that the role is open to women as well as men’. She suggested by using the male suffix the title gives the impression it is only meant for men. Angharad Davies (Con, Northern Rother), who proposed the Tory amendment, said: “Women only want one thing, to be treated equally. But he added: “A chair is a piece of furniture and an inanimate object and every time that word is used in this room and elsewhere I feel not only that it’s impersonal it’s actually rude. “So can we please find another term that will work. I do not know whether that’s chairperson, convenor, presiding officer, whatever, we must try and find a term. But Darren Grover (LDem, Newhaven and Bishopstone) pointed out that the council uses the terms chair and vice-chair for scrutiny committees and asked if Cllr Galley was ‘worried he may be confused with a four-legged piece of furniture made of dead wood’. Trevor Webb (Lab, Hastings - Central St Leonards and Gensing), leader of the Labour group, said he ‘totally disagreed’ with the Conservative amendment. He suggested councillors had not listened properly to Cllr Osborne when she talked about getting more women involved in the political process, something he widened out to BAME groups and people with disabilities. 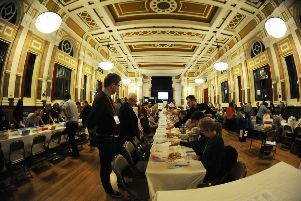 The gender balance at County Hall, currently 42 male councillors to eight female councillors was raised by David Tutt (LDem, Eastbourne - St Anthony’s), leader of the Lib Dem group. Michael Ensor (Con, Bexhill North) who finished his term as chairman at the start of the meeting, described a recent trip to France where each local department has a president and joked whether they should instead have a president of East Sussex County Council.